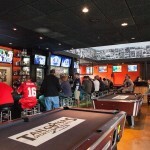 You want to know about TailGaters Sports Bar & Grill? 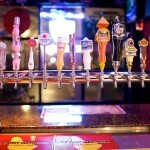 We are your front row seat to great sports, food and entertainment. Your local hometown sports bar and grill dedicated to giving you great product and the greatest time with or without the sports. From Tailgaters exclusive food items/cocktails to helpful tailgaters staff who care and the best televised (Direct TV)/pay per view sporting events, the one thing you can count on is the best time that can be had anywhere without actually being on the field, in the octagon or in the arena. Everyday at Tailgaters there is something happening whether that be our Sunday NFL Breakfast during football season, Saturday MMA Fights, or our Tailgater’s Monday Wings Night to go with Monday Night Football— you will find that this hometown sports bar & grill is the place to be. TailGaters Sports Bar & Grill also does catering. Wings, sandwiches, hamburgers, sliders, salads and more… we can deliver great tasting food to any private or public event. So whether you are watching UFC fights, your favorite NFL game, PGA Tour events, or the NHL, NBA and NCAA competitions — The thing that is most important to us at TailGaters Sports Bar & Grill is that we deliver good times and quality service with a smile, that will leave you smiling. Our commitment to excellence and our local community has no equal— this is our promise to you our Guest. Check out our complete weekly lineup and events page. You’ll enjoy our televised sports and menu specials. For more information or to make a reservation for a special event or get a quote for catering please contact us below. You can also make your reservations here. And remember don’t forget to download our Tailgaters Sports Bars Mobile App to take advantage of: Special Discounts, QR Coupons, Loyalty Coupons and Push Notification special messages!